Interactive play is terribly important for young children and water play is often a firm favourite with littlies and an easy option for parents. Now while I’m all for making a splash and dealing with the wet clothes later, there are times when it’s just not a practical option. So with this, I present to you a form of dry water play! These water blocks are exactly that – simply shaped blocks filled with water tinted in varying primary colours. Toddlers will love watching the water swish around inside the hardwood block. 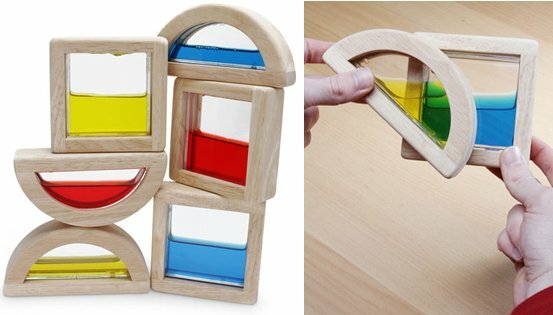 Let them explore colour combinations as they stack various colours on top of each other and peek through the acrylic window. There’s no mess, no fuss and lots of fun without getting even a little bit wet. A set of Water Blocks consists of six blocks and are the perfect size for small hands (and handbags). Find them at Think Geek for US$39.99, with delivery to Australia available.